The BinWeevils Mission 1 The Lost Bin Pet Walkthrough is now available for you to check out on this page. This BinWeevils walkthrough will guide you through the mission from start to finish. If you get stuck on a puzzle or can’t find a missing object than take a minute to watch our BinWeevils Mission 1 The Lost Bin Pet walkthrough video. As we will always do for all of our walkthroughs we will have both the text version and the video version to help you out. Take a look below to get the full walkthrough! To begin, you must go to the Secret Weevil Service and check into Mission 1. From there they will give you a short briefing of some of the evidence they have on this person. When you are done with the briefing you need to head over to the airport and get on a direct flight to Mulch Island to start your mission. If you are new at the game and don’t know how to get to the airport watch the first part of the BinWeevils Mission 1 The Lost Bin Pet walkthrough video. As you arrive you will need to find the wooden sign with an arrow on it and click on it. The next part you will have to talk to a security guard before you can get past the blocked passage way. He will ask you a series of questions and in the end you will need to answer him with what color is the bin pet that you are looking for. Of course, the answer is pink. Once you get inside the gates your goal is to find all the missing pieces to the tablet. Right away you should notice a pair of binoculars to your right. Pick these up as you will need these later on in the mission. Leaning up against the wall right next to the binoculars you should see the first piece to the tablet. Make sure to grab this piece. If you look towards the back right corner on the bricks you should notice a red crowbar and a bowl of food. Put both of these in your backpack because you will need them later down the road. In the back left corner hanging in the trees you should be able to spot another piece to the tablet. Before you walk off to the next part to find missing parts watch the BinWeevils Mission 1 The Lost Bin Pet Walkthrough video if you can’t find some of the pieces. Next, walk straight down the path to reach the second place to finish finding your pieces. Once you get there you will notice a brick to your left that appears there could be something under it. Use your crowbar from your backpack to pry it open and grab your tablet piece. 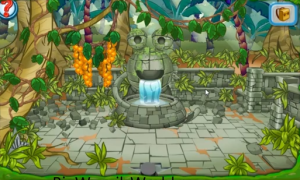 To the left of the fountain there are some hanging oranges that you should click on to make them drop. Then pick them up and store in your pack. Hidden in the front left corner you should see another piece of the tablet. After you have picked this piece up click on the path to the right to reach the third spot to find the rest of the pieces. 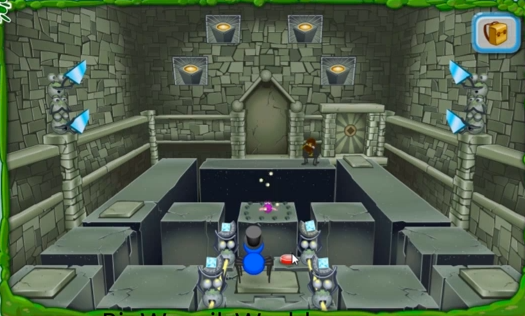 Again, if you are stuck take a minute to watch the BinWeevils Mission 1 The Lost Bin Pet Walkthrough. When you walk into the next part you will notice two things right away that you need to pick up. The first is on your right which is a set of teeth and the second is on your left which is another piece to the tablet. Grab both of these and put in your backpack. You will also see a dangling vine in front of you that you can click. When you click on it the next tablet piece will appear in front of your feet. Now in order to use the oranges in the next part of the mission you need to lay them in front of the smelly flower so it will attract flies. Take a look at the BinWeevils Mission 1 The Lost Bin Pet walkthrough video to see what I mean and where I put them. When you are done with this part click on the wheelbarrow to get the next piece to the tablet. It will be in the wheelbarrow underneath the dirt. Next, go back to where you just came from to get the last piece to the tablet. The tablet is in the water fountain. In order to reach the tablet you need to put the teeth in the mouth of the fountain to stop the water. Then you should notice the tablet. Now go back to the spot to build the tablet and put all your pieces on top of it then click on it. You now have to piece them together to get to part 2 of the mission. Watch the BinWeevils Mission 1 The Lost Bin Pet walkthrough video to see how to piece it together if you get confused. Now that you have found all the pieces to the tablet you are now ready to get past the guard but in order to do this you need a few important objects first. Without the guard seeing you (wait until his back is turned) grab the rubber band on the left and the broken coconut on the right then get back behind the wall so he can’t see you. Next, drag the rubber band to the opening between the two walls to make a slingshot. Also, drag the coconut on the rubber band as well. Through the oranges next to the slingshot so you can use it as ammo. The next part is tricky. Place your binoculars on the wall and look through them to see the code the guard is using to open the door. The code is always different so you must remember it when you see it or you won’t be able to get in the door. 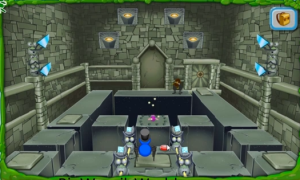 If you want to see how we set everything up take a look at the BinWeevils Mission 1 The Lost Bin Pet walkthrough video quick but remember the code will not be the same. When you get the code use the slingshot to fire the oranges at the guard. You need to hit four fly nests and the guard once to get him away from the door. Good luck. Once inside you have to try to catch the criminal; however, you need to figure out the puzzle of each room first. Since this can be understood more easily by video we will only show this on the BinWeevils Mission 1 The Lost Bin Pet walkthrough video. There are six levels and all of them get harder to figure out each room you go into. Good luck! Whether you have completed this mission or not we hope you have enjoyed the BinWeevils Mission 1 The Lost Bin Pet walkthrough and encourage you to leave a comment below with your thoughts of this Binweevils mission to share with all of our visitors.